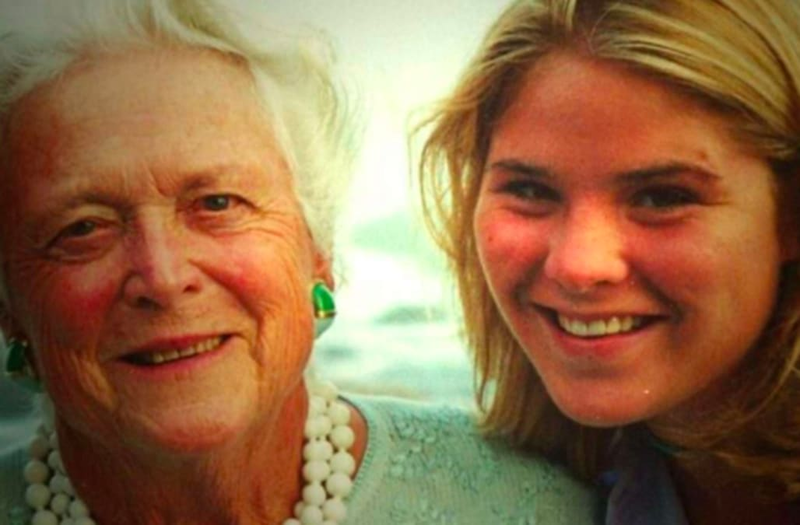 Jenna Bush Hager paid emotional tribute to her late grandmother, Barbara Bush, on the "Today" show on Thursday by reading a tear-jerking letter addressed to the former first lady. "Dearest Ganny, when we lost you, we lost one of the greats," Jenna began. "You are a family's rock; the glue that held us together. I hope you know in your final days how many people prayed for you, how many people told me they loved you. It was like that my whole life. People stopped me everywhere -- in the airports, on the street -- and declared their love for you. It always felt good. We didn't mind sharing you with the world." "We called you 'The Enforcer,'" she went on. "It was because you were a force and you wrote the rules. Your rules were simple: Treat everyone equally, don't look down on anyone, use your voices for good, read all the great books -- oh, how I'll miss sharing books with you!" The "Today" show correspondent, whose voice could be heard via a voiceover as she was not in the studio on Thursday morning, added that her grandmother taught her grandchildren "humility and grace" and that she and George H.W. Bush "embodied unconditional love." "From you, Ganny, I've learned the gift of uniqueness and authenticity," Jenna read on. "You taught us that humor, wit and grace are the best accessories, and that worrying too much about your looks, in your own words, 'is boring. Words matter, kindness matters, looks fade.'" In a particularly emotional part of her lengthy letter, Bush Hager shared a screenshot from one of the last emails that her grandmother had written to her. The simple note was penned back in February. "One of your final emails to me was simple and true," Bush Hager said. "The subject line read, 'You.' In the body of the email you wrote, 'I am watching you. I love you. Ganny.' Well, Ganny, we have spent our lives watching you. Your words inspired us, your actions an example to follow." "You always said that you were one of the luckiest women to ever live, but, Gans, I am filled with gratitude because you were ours," she finished. "We are the lucky ones." After she finished her letter, signed "Love, Jenna," the correspondent phoned into the "Today" show to chat with Savannah Guthrie and Hoda Kotb, who had been reduced to tears during the segment. When asked how she and the rest of her famous family were holding up following Barbara's death, Bush Hager gave a positive update from the Bush's. "We're doing well," she said. "I think it's a mixture of waves of great gratitude for a life well-lived -- I mean, she lived the best life -- and also the tributes that are pouring and for the people that care, it's really remarkable. And then, of course, pangs of sadness, because she will be so dearly missed." Watch the full moment in the video at the top of the page.